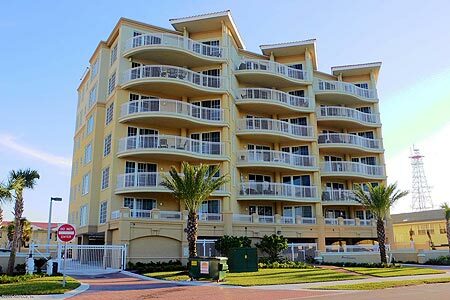 Beach Terraces condominium in Jacksonville Beach, Florida. Beach Terraces is a resort-style condominium community in Jacksonville Beach. Located on oceansibetween First and Second Streets, Beach Terraces condominiums offer an ocean view from every residence. Experience for yourself what beach living is all about. While nature provides the warm sands, tangy salt air, and sparkling waters of the Atlantic, Beach Terraces enhances the natural surroundings with creative floor plans, valuable amenities and special attention to detail. Indulge your senses. Make Beach Terraces your home for a lifetime. Large windows and sweeping terraces provide unobstructed views of one of the most beautiful stretches of the East Coast. Thoughtfully designed floor plans take full advantage of the exceptional setting while providing comfortable and convenient living space. The mid-rise seven floor building, with only 18 private residences, exclusively defines the Beach Terraces community. Imagine only 100 steps to the sand for an early morning walk on a quiet stretch of sand. Or an afternoon socializing with friends gathered at the beach. Or wind down your evening on your private terrace listening to the rhythmic sounds of the ocean. Just beyond your beach home lies the exciting atmosphere of Jacksonville Beach. Explore unique gift shops, feast in a variety of dining venues, or take in a jazz concert or classic movie at the Sea Walk Pavilion.